The Pacific War Online Encyclopedia: Wootten, George F.
Woods was a veteran of Gallipoli who later made his reputation as an outstanding staff officer in Haig's headquarters in France in the First World War. Like most Australian officers, he returned to civilian life between the wars, returning to Australia in 1926 for the sake of his children's health. Here he became a lawyer, though not a prosperous one, supplementing his meager income with farming and his Army pension. The approach of war led Wootten back into the service in 1937 as a lieutenant colonel. By this time he had given up smoking and, like many who do, had put on considerable weight: Though only 5'9" (175 cm) tall, he weighted 280 pounds (127 kg). In spite of doubts about his physical fitness, he joined 2 Australian Imperial Force and was posted to a battalion command in Palestine. He then commanded 18 Brigade, 7 Division in Greece and at Tobruk. After the outbreak of war in the Pacific led to the recall of 7 Division, Wootten led his brigade in New Guinea, including the successful defense of Milne Bay, which was Japan's first land defeat in the Pacific War. 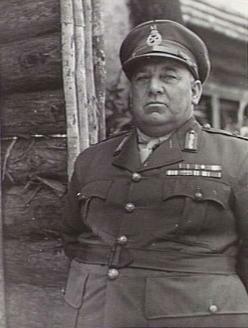 He then participated in the Buna campaign before being promoted to command of 9 Division in March 1943. His division earned a very high reputation in the Southwest Pacific, fighting in the Huon Peninsula and Borneo, and MacArthur described him as "the best soldier in the Australian Army who had it in him to reach the highest position." His ferocious temper was considerably offset by his genuine sense of humor, which extended to joking about his own massiveness. Postwar Wootten was named to the Court of Inquiry into Gordon Bennett's escape from Singapore, a duty he detested, and he became involved in veteran's affairs, which was rather more to his liking. He was knighted in 1958, the year of his retirement.